Free Tony The Tiger is dedicated to raising awareness for Tony and to securing his release to an accredited big cat sanctuary where he can receive the care, home, diet, enrichment, medical care and respect he deserves. It is also the mission of Free Tony The Tiger to bring attention to the severe problem of privately owned tigers in the United States. This bill would prohibit private possession of big cats except at highly-qualified facilities like accredited zoos where they can be properly cared for and safely managed. Tony represents one of the estimated 5,000 plus privately owned tigers in the United States whose numbers are greater than tigers in the wild. Captive U.S. tigers are used in roadside zoos and attractions, photo ops and exhibitions, entertainment shows, pseudo-sanctuaries, bred for profit or are owned as “pets.” Others end up in canned hunts or on the black market. There is no conservation value in privately breeding tigers. The only sanctioned tiger breeding program in the United States is the Species Survival Plan in which AZA accredited zoos participate. Not all animal rescue centers and sanctuaries are what they claim to be. A true sanctuary would never buy, sell, trade, breed, or cart their animals to malls, fairs, etc. Please view these very important and informative videos from Big Cat Rescue – Tampa Florida addressing this issue. Tiger cubs are exploited and abused in money-making ploys disguised as “educational shows.” There is nothing educational about displaying cubs in hands-on exhibitions and photo ops – but it is how individuals and pseudo-sanctuaries capitalize on the appeal of these baby tigers and other big cat cubs to lure the public into their unscrupulous schemes. Exploiting tiger cubs by allowing the public to interact with them is not educational, but dangerous and misleading, as well as harmful to the cubs. The real life horrors these cats face once they shed their “cuteness” and turn into 300 to 500 lb. predators are years of captive life in deplorable conditions. Please don’t contribute to this abuse by engaging in these exhibitions, supporting or promoting them. 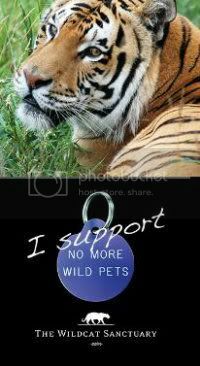 Share links to videos and articles about tigers to network the plights they face both in captivity and the wild – some of which have been included in this post. Facilities that breed, buy, sell, force their animals to perform and exhibit them off site are just profiting from these animals and should be avoided. Such majestic and magnificent cats like tigers should be respected and protected and it is up to those of us who care about Tony and tigers like him to continue to be a strong voice for them. Thank you. I have been keeping track of this story on facebook, youtube, and Big Cat Rescue’s web page. I post and share this story often. I blog thru WordPress.com also and added a link to your page from mine; although probably should have asked first, I am new to WordPress and didn’t think to ask your permission first. 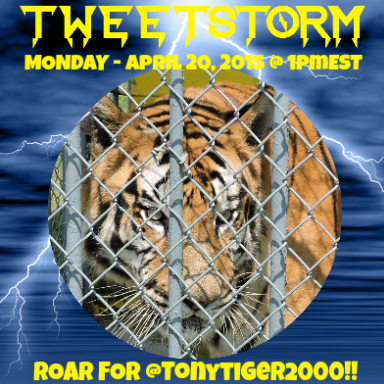 Hope you don’t mind as tigers are a passion of mine and I want to help spread the word on this cause as well, and appreciate the work you’ve put into helping free Tony the Tiger. Thank you so much for caring about Tony. I definitely appreciate you adding the link to his page on yours – it’s important to continue networking Tony’s story so more people know of his situation and more support is gained for Tony. The governor’s contact link is now working after being down most of yesterday. PLEASE email him about Tony. You do NOT have to be a resident of his state or a US citizen. As you fill in contact info you will come to PARISH – click that on and scroll down to the bottom where y…ou will see “out of state”. We have to flood his office with emails. Include please the most recent video of Tony showing how much he has declined. We have to get this tiger out sap. You might also add an investigation of the LDWF is in order for even allowing the permit in the first place. Let’s all ROAR as loud as possible this weekend and every day until Tony is romping in a decent sanctuary. Thank you very very much – that is not from me, but from Tony !!!! ROAR and ROAR again !!! Please share with everyone. I have contacted Turpentine Creek Wildlife Refuge,in Arkansas,about Tony. I hope to hear from them soon! Please know that while WSPA opposes the use of animals for entertainment when such use is contrary to the animals’ nature, or may involve suffering or adversely affect the animals’ welfare, we primarily work outside of the US, in developing countries; and rarely work on individual cases or in areas that we are not experts in, such as large cats. However, I have contacted the organization that is leading the charge on this battle, one of WSPA’s Member Societies: Big Cat Rescue. According to Ms. Carole Baskin, CEO of Big Cat Rescue, they are willing to provide a home for Tony. 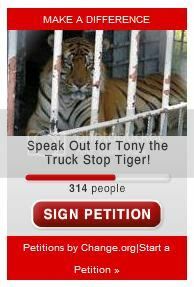 They have informed PETA, HSUS, and Born Free of this and of their efforts to help Tony. 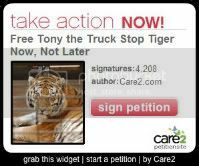 Unfortunately, they cannot legally force Michael Sandlin – the truck stop owner – to give Tony up and they will not pay for Tony, as this will only encourage him to purchase another tiger and fuel the trade. The Iberville Parish has allowed Michael Sandlin to keep Tony at the truck stop. 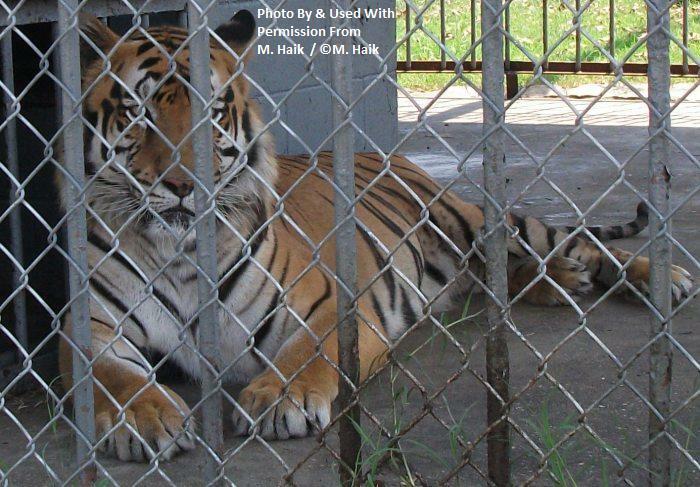 Read the ordinance at http://www.bigcatrescue.org/images/abuse/PDF/TonyTigerOrdinance.pdf. Now he must obtain a permit from the Louisiana Department of Wildlife and Fisheries. Carole and her team suggest contacting the Louisiana Department of Wildlife and Fisheries and ask that they not issue a permit to the Truck Stop and that they send Tony the tiger to Big Cat Rescue in Tampa, FL. The Louisiana Department of Wildlife and Fisheries granted the permit To Tony’s owner on December 14, 2009. Have you tried contacting PAWS in Calif.? The Performing Animal Welfare Society is a huge sanctuary that has rescued many animals such as Tony. The founder, Pat Derby is a fireball to say the least. This week they are busy with their annual Summit for the Elephants, but go to their website for contact information. pawsweb.org. This organization managed to rescue a tiger in Mexico, I’ll bet they could do the same for Tony. I will keep this poor beautiful animal in my thoughts and prayers. He will be saved.